Some Windows 10 users concern about its privacy issues like the new telemetry features in the new operating system. But Microsoft says that they help to improve the user experience by collecting data. If you dont want to send the telemetry or want to block it then try the Spybot Anti-Beacon tool.Spybot Anti-Beacon is a free tool to block various tracking features in Windows 10. 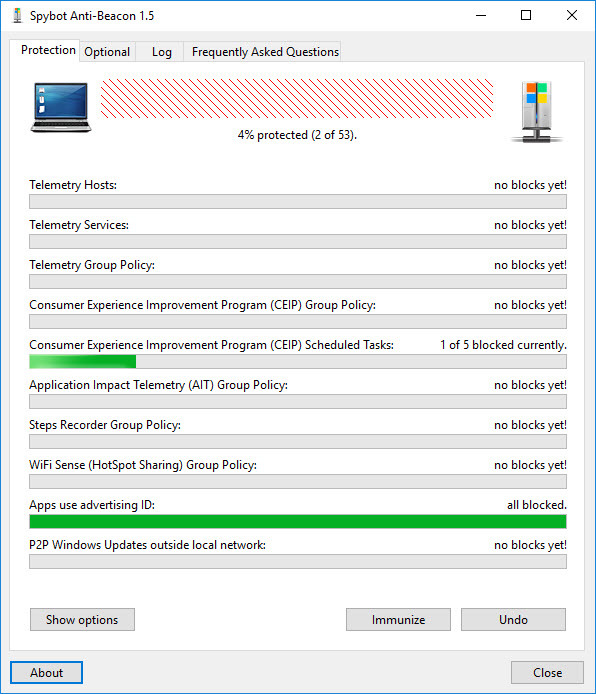 Using this new tool you can block Telemetry Hosts and services, Telemetry group policy, application impact telemetry,consumer experience improvement program, Wifi sense, apps using advertising ID, P2P windows update, Web search and cortana policy and office telemetry policy. Spybot Anti-Beacon comes under 3MB in size and it is also available as a portable app. The user interface is also very simple. To block all services just click Immunize button. And if you want to unselect some options just click the show options button and uncheck the option and then click the immunize button.